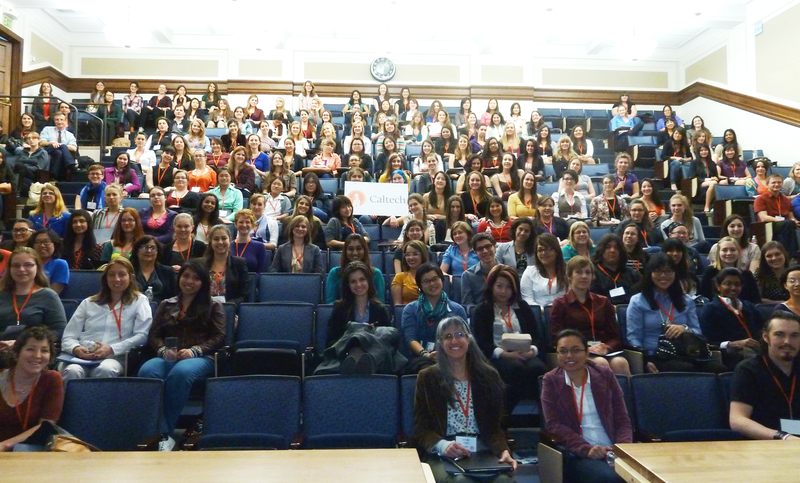 Conference for Undergraduate Women in Physics, Caltech, 19 January 2013. On January 18-20, Caltech was one of the host campuses for the annual Conference for Undergraduate Women in Physics. Nearly 200 women attended here, mostly physics majors from the western US. It was an exciting and fun event, packed with talks, panel discussions, lab tours, a poster session, and other activities. One highlight was a screening of The PhD Movie, followed by a discussion with director Jorge Cham and the cast (real-life Caltech grad students Alex Lockwood and Crystal Dilworth, and undergrad Raj Katti). The movie, filmed on location at Caltech, provides a very funny look at the misery of graduate student life. You can get a pretty accurate impression of the movie’s tone by viewing the trailer. The discussion afterward featured poignant warnings about the pitfalls of graduate school, and emphasized the importance of having the right mentor. I found myself reflecting on my own experience. Graduate school will sometimes deal grave blows to your self confidence, but it can also be a time of exhilarating intellectual growth. The highs are high but the lows are low. One thing we try to do at Quantum Frontiers is provide a variety of perspectives on the graduate student experience by featuring our students as contributors. Today we’ll try something a bit different: a profile of grad student Debaleena Nandi from Caltech writer Ann Wendland. Debaleena Nandi, in the lab as usual. 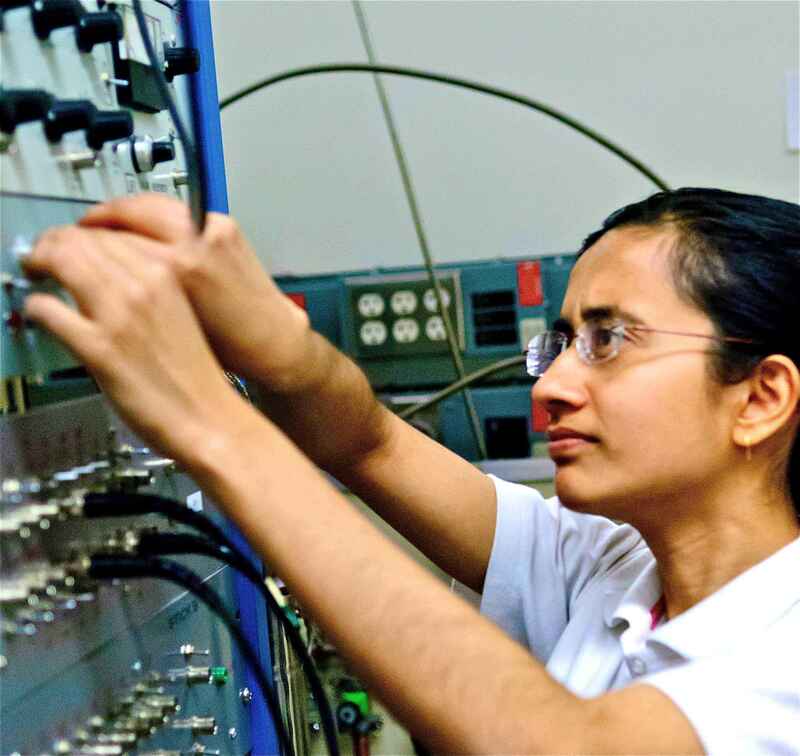 In March 2008, a graduate student at the Indian Institute of Science (IISc) named Debaleena Nandi heard Caltech physics professor Jim Eisenstein give a series of lectures on two-dimensional systems of quantum electronic matter. “I was very keen to take a peek into his lab,” she says—so keen that, with a friend by her side for moral support, she walked up to Eisenstein and asked if she could join his group for the summer. Eisenstein had noted her smart questions during his talks and said he was open to the idea. Still, he was surprised when he returned to Caltech and found she’d e-mailed him. A few months later, Nandi rented an apartment in Pasadena and left India for the first time. In 2011, she led an experiment on two thin layers of metal separated by an insulator, working with Eisenstein, Finck, and two Princeton electrical engineers. She applied a strong magnetic field to the system and discovered something novel: when a current flowed through one layer, a quantum effect caused the electrons in the other layer to flow in an equally large current in the opposite direction. She and the team wrote a paper on the discovery and submitted it to the leading science journal Nature (arXiv version here). A few months after the conference, Nature published Nandi et al’s paper and highlighted it with a special News and Views commentary. This entry was posted in Experimental highlights, Reflections and tagged Caltech, Graduate school, Jorge Cham by preskill. Bookmark the permalink.